It's here!! All the new MFT December products are available NOW at the MFT store! Make sure to check out their blog post for the links to all the other MFT DT member's launch posts - the more comments you leave the more chances you have to WIN! Speaking of which - be sure to check out the whole post as there's info on how you can be entered to win one of 2 MFT $100 GC's! For my projects tonight I'm focusing on the new Stitched Fishtail Flag STAX Die-namics, and the new Friend Die-namics (which you can only get this month as a Free with $60 purchase - next month it will be available for individual sale). I actually made a scrapbook page! It's been FOREVER since I've dabbled with pages. I had this photo of Katelyn from last year and it was just too perfect for so many of this month's products to not make a page for it. The Stitched Fishtail Flag STAX Die-namics made a great background - I die cut several from Smooth White and Sno Cone card stock. Then I took inspiration from her little sweater and stamped the white die cuts with last month's Sweater Stitch Background stamp and embossed it with matte clear embossing powder. For my little bit of journalling I just drew lines with a ruler and pencil then wrote with a brown pen. The new Emmitt Alphabet and Emmitt Numbers & Symbols Die-namics were perfect for this page, and the heart was a leftover piece from the Photo Booth Props Die-namics. It just gave it a fun gloss. I did the same thing on the inside - stamped everything with pigment inks then embossed with clear. For my final card I use the Stitched Fishtail Flags STAX again, and combined them with the new Go with It stamp set and Die-namics. GIVEAWAY info!! Visit each of the MFT Designers' December Product Launch posts linked on the MFT Blog and leave a comment by the end of the day on Thursday, December 4, 2014 for your chance to WIN one of two, $100 Gift Vouchers. The winners will be chosen at random from the comments on all the designer's blog posts. WooHoo! If you can see this post it means all the new products I've been teasing you guys with for the past week are now available at the MFT store!! You can find them all HERE. 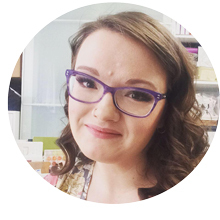 I've got a couple more projects to share with you guys using the new goodies, and make sure you check out the MFT blog post HERE for links to all the other Team Member's posts to see what they've created for you as well. I wanted to create a nighttime "scene" so I used Nightshift Blue card stock for my sky, and embossed the scattered stars stamp from the Roughing It set onto the card stock using Versamark and silver embossing powder. Then I used the Campy Tree Lines Die-namics and Black Licorice card stock to silhouette them in front of the night sky - love how it turned out! I stamped the camper from the Roughing It set onto the card stock with Versamark and embossed it with silver EP as well - LOVE! The sentiment was done separately - the first half I stamped and embossed with silver and the second half I stamped onto a piece of Grout Grey card stock with Nightshift Blue ink and die cut with a Fishtail Flags STAX Die-namics die. On the inside of the card I stamped the camper again, this time with Black Licorice ink, and then stamped the scattered star image repeatedly with Nightshift Blue ink. I only inked up the stamp a couple of times and just kept stamping it to get various shades of blue. 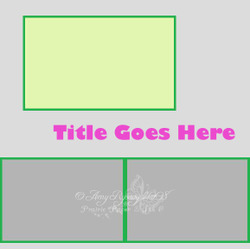 I used the large tag die from the Blueprints 9 set to create the base for this album (so it's roughly A2 sized). For the title I used the new Magical Memories Die-namics, Months of the Year Die-namics, Roughing It Die-namics and stamp set, Campy Tree Lines Die-namics and the Wood Plank background stamp. If you've read my blog for any length of time you'll know I *rarely* scrapbook or do anything like that. I just don't. But with all these campy/outdoorsy/perfect for scrapbooking products MFT's released this month I was inspired to step out of my comfort zone LOL! My hubby is planning to go on a hiking trip with his brothers this summer, and I thought I should make him a mini album of sorts to be able to put the pictures he takes on his trip in it. And since it's pretty likely that most if not all the pics he takes will be taken with his phone they won't be large files and therefore perfect to print in smaller sizes and fit into an album like this. I used the little bootprint stamps from the Roughing It stamp set and stamped them along the bottom of most of the pages with Chocolate Brown ink. 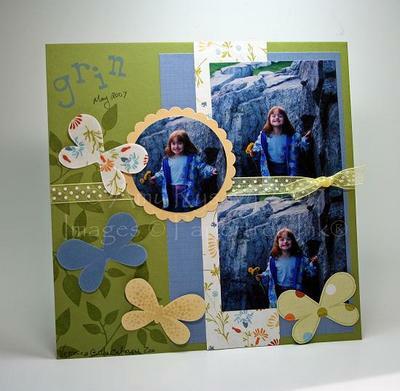 And I used the new In the Wilderness Background stamp on a few of the pages as well - SO perfect for this project! I also pulled out last month's Making Waves Die-namics and added those to a couple of the pages. They're going to be on the coast during their trip so I anticipate a few pictures that will work for it. I used my Crop-a-Dile to punch the holes through all the pages - I just stacked them all together and punched through them at the same time. Then I found some large brown eyelets in my stash (another time it's worked out to hoard things!) that I added to the pages. I wasn't going to at first but then thought it would give the pages a bit of reinforcement - MFT card stock is heavy weight but over time getting flipped through I didn't want it to tear so I thought I may as well add the eyelets. I had the ring in my stash as well so I popped all the pages onto it and it was done! Tim's pretty pleased with it. I technically made it for his birthday which is coming up in a couple of days - but I'm rotten at waiting so I gave it to him as soon as it was done LOL. I wasn't expecting him to like it as much as he did. And I got a kick out of the fact that he noticed the quality of the card stock (it was one of the first things he said - that it seemed really sturdy and nice ;)). So my little project made him happy and I have high hopes that it will encourage him to take pictures and hopefully document his trip when he goes! Now for the IMPORTANT info!! Visit each of the MFT Designers' March Product Launch posts linked on the MFT Blog and leave a comment by the end of the day on Thursday, March 13 for your chance to WIN one of two, $100 Gift Vouchers. The winners will be chosen at random from the comments on all the designer's blog posts. Ready? Set. Comment! I got 2 more pages done!! YAY! I printed the pictures myself with a Kodak EasyShare 5300 printer - they were 5x7 with a border and I cut the border off so they're a bit smaller than that. The patterned paper is by My Mind's Eye, and the title was done with my CuttleBug Red Tag Alpha (I embossed some black card stock with Iridescent Ice embossing powder (Stampin' Up!) before die cutting the letters) and adhered to 2 Super Jumbo Scalloped hearts. The flowers are grey Prima Sprites, and all the bling is from the dollar section at Michaels. The die cut hearts are another CuttleBug die. 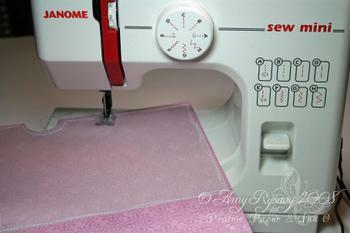 I used my Crop-a-dile to punch the holes to thread the ribbon through. The journaling was done by hand (I HATE my handwriting - but I know that it's something the girls will appreciate when they're older (at least I'm hoping so!)) 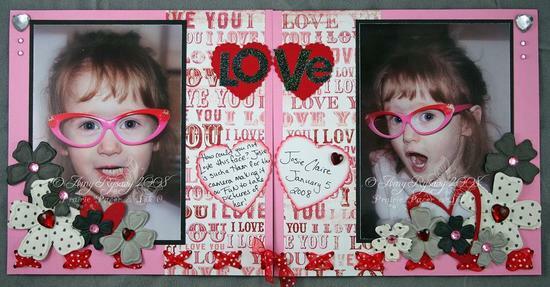 on 2 Mega Scalloped heart punch outs. *snicker* I just love these pictures - Josie really IS a total goofball - AND a drama queen - it will be really interesting to see what she's like as she gets older! You can find out more about this challenge HERE <-------click! These pages came easy for me though - I've had the idea for them for months and so it was only a matter of clearing some space off my desk and getting to work! I took these pictures back in the summer before we moved - and when Gina released her Make a Wish - Stamps For a Cause set with the dandelion image I KNEW I'd have to use that with these pictures on a scrapbook page! This is a 2-page layout - the pages are 8x8" (I am LOVING this size - I used to do 12x12 pages and while I like having more room for pictures, I started to dread making them b/c they took up so much room on my desk and it was just getting difficult to be able to get a page done without having every available surface covered! Now that I'm doing this size tho I can do a 2-page layout and it doesn't take nearly as long and doesn't take up nearly as much space! LOVE it!). I cropped the main pictures to 3x5", and the smaller ones to 2.5x4". GinaK's dandelion stamp was inked up with craft ink, stamped onto the card stock, then embossed with Iridescent Ice (Stampin' Up!) embossing powder. The letters are all die-cut - I just love how they turned out! I used a couple of pieces of Pink Passion (SU!) card stock - covered them with VersaMark ink then with Iridescent Ice EP and heated them. Once they had cooled I used my CuttleBug Red Tag Sale Alphabet to cut out the letters I needed. EDITED TO ADD: Yes I am quite proud of my idea to make glittery card stock to die cut the letters from (at first I was planning on die cutting the letters then covering them with some sort of adhesive and THEN covering them with glitter - but then I thought "there has to be a better (less messier!) way!!" and came up with this idea). For something even EASIER - you can actually buy glitterfied card stock in yummy colors - DoodleBug Sugar Coated CS to be exact - which will definitely be going on my next order from ATS (b/c I STILL had VersaMark and Iridescent Ice EP all over the place....). I also used that alpha set to die cut 2 small tags (the set comes with a die for one large and one smaller tag) that I stapled ribbon to and slipped behind each main picture to use for the journalling. The ribbon is from Michaels (I used sticky strip to attach the ribbon to the bottom of the page), the flowers are Prima and I used Dollarama (jumbo) brads and Bazzill Brads to attach them. If you'd like to use this sketch to make a page (or 2!) and upload it to Splitcoast please use the keyword SBDD10_AmyR so that it's easier to find! 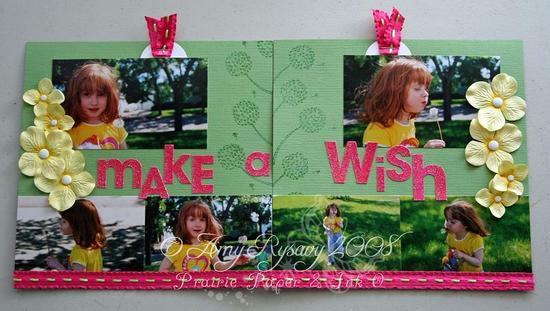 STAMPS: Make a Wish stamp set by GinaK Designs (Stamps For a Cause). CS: Wild Wasabi Textured, Pink Passion (Stampin' Up!). INK: VersaMark, Garden Green Craft Ink. ACCESSORIES: Iridescent Ice Embossing Powder, CuttleBug Red Tage Sale Alphabet Dies, Prima Flowers, Brads, Ribbon. I've received several e-mails and comments from people asking how I made the yellow butterfly on the scrapbook page in this post. It's a stamp from the Papertrey Butterfly Kisses set (click on that link and check out the set and you will see which stamp I used) - I stamped it in VersaMark then embossed it with clear embossing powder - that was the challenge I put out for everyone - and THIS particular stamp was great for a challenge like this b/c it (obviously) stamds out so well! I thought it would be best to post that here instead of answering each e-mail individually - and I will be editing the original post to include this info as well. Tim's response to that title is "Tell me something I DON'T know..." -------- ROFLOL!! I'm not talking about THAT kind of Diva (tho I guess at times I can be one - *wink*) - but rather a Scrapbook Diva over on Splitcoast (along with some of the other fabulous gals from the Papertrey Design Team - Nichole, Lisa and Taylor!) today. You can find out more about our challenges and whatnot in this thread HERE <------click!! 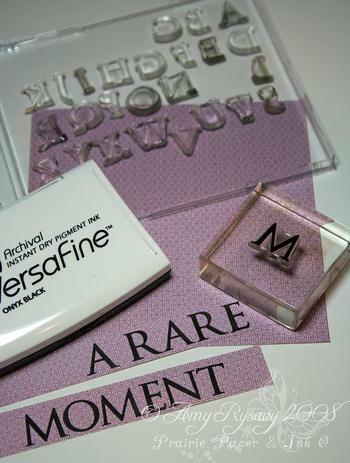 I used butterfly stamps from Papertrey's Butterfly Kisses stamp set along with VersaMark ink and clear embossing powder to make matching embellishments for my page (supplies including the type of patterned paper are at the end of this post). (all of these pictures can be clicked on to get a pop-up window with a larger view). This is an 8x8 page layout. EDITED TO ADD: The yellow butterfly is the same as all the other ones - the dotted butterfly stamp was inked up with VersaMark then embossed with clear embossing powder - it ended up looking like dew drops!! And of course even if you want to play just for fun I'd love that too! 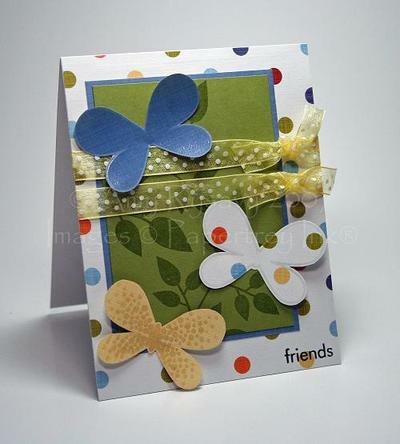 Scrapbook Page Supplies: STAMPS: Papertrey's Butterfly Kisses and Beautiful Blooms stamp sets, SU! 's Spunky Alphabet Set (retired). CS: Old Olive, So Saffron, Chatterbox Patterned Papers (Sun Room collection in Light Summer Flowers, Olive Beach Dot and Beach Dot). INK: VersaMark, Old Olive Classis, Brocade Blue Craft. 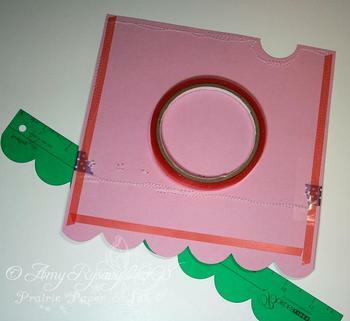 ACCESSORIES: Clear Embossing powder, Marvy Mage Circle and Giga Scalloped Circle Punches, May Arts Ribbon. 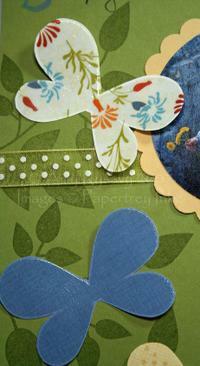 Card Supplies: STAMPS: Papertrey's Butterfly Kisses, Beautiful Blooms and Paper Tray stamp sets. CS: Old Olive, White, Chatterbox Patterned Papers (Sun Room collection in Light Summer Flowers, Olive Beach Dot and Beach Dot). INK: Old Olive Classic, VersaMark, black. 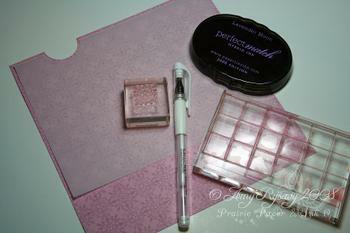 ACCESSORIES: Clear Embossing powder, May Arts Ribbon. SETS: Island Blossoms, Letterpress Alpha. CS: Whisper White, Pixie Pink, Night of Navy. INK: Whisper White, Pixie Pink, Night of Navy all Craft. 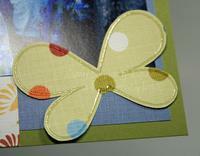 ACCESSORIES: Buttons, White Embroidery Thread, Small Corner Rounder. Here's another one of my early pages - this was when I started to figure out what a layout was lol! When I was done it really struck me how much better a page looks when the photos are laid out properly as opposed to being just slapped on a page! I used the little flower from Island Blossoms (level 3 hostess set now retired) in Whisper White and Pixie Pink Craft Ink. JUMP was stamped in Night of Navy using Letterpress Alpha. CS and INK: Very Vanilla, Pretty In Pink, Sage Shadow, Lavender Lace (all Craft Inks). SETS: Retro Alpha Upper, Welcome, Little One (both retired). ACCESSORIES: SU Buttons (tied on w/ embroidery thread), and non-SU ribbon. FYI - you can click on the picture and it will pop up in a separate window as a bigger image - HTH! 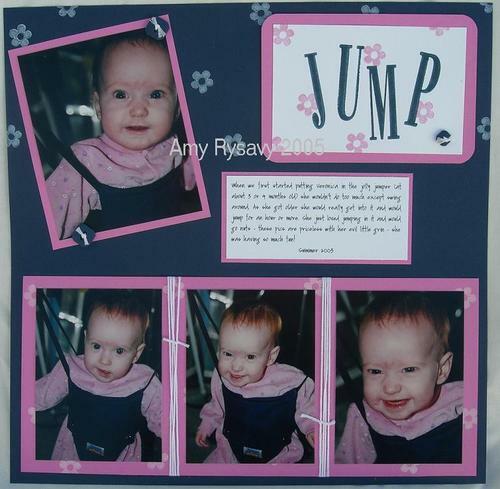 This 2 page layout was the very first 12x12 scrapbooking I ever did. I had NO clue what I was doing - my only goal was to get the pictures and information on the card stock - I didn't know a thing about layout and color combos or anything else about scrapbooking for that matter! I used SU's old paper saving template (no longer available) that basically showed how to use an 8 1/2 x 11" sheet of CS over the 12x12 to have an alternate color and where to cut the 12x12 to save on CS. This was when my oldest daughter was born. We took *tons* of pictures - and I do mean tons - I think we had 3 or 4 rolls of film developed before we left the hospital (I was in for almost a week b/c of complications - everything went well tho). I picked out my favorite pictures for these 2 pages. I did the letters w/ SU's (retired) Retro Alphabet Upper and the sentiment (on page 2), baby image and flowers on the main pages were from SU's (also retired) Welcome, Little One. The blank square on the first page has personal info that I blurred out. I used grosgrain I bought at Michaels and SU buttons as embellishments. I pressed the buttons into Craft Inks that matched the CS and dried them w/ the heat tool (it took a few layers of color to completely cover the buttons and I'm pretty sure I sanded them before hand to better hold the ink). So there you have my first attempt at scrapbooking. Some of my other pages look even worse than these 2 - those ones I may change but I plan on leaving these as is just to remember my first attempt!! I pulled out the scrapbook last night - so I won't be making a ton of cards like I've been doing lately!! 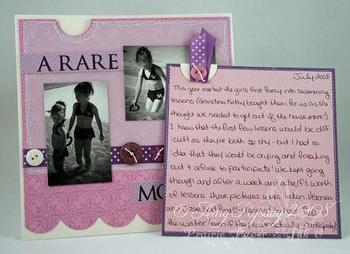 I scrapbook in spurts - when I do it I go all out and make a HUGE mess and have a ton of fun! I don't get a lot of pages done b/c I take my time w/ it - sometimes spending a whole day on a 2 page layout. I *savor* every minute of my scrap booking and yes I am like 2 years behind on Veronica's pages (she's 3 1/2) and I haven't even started on Josie's (she's almost 9 months now). 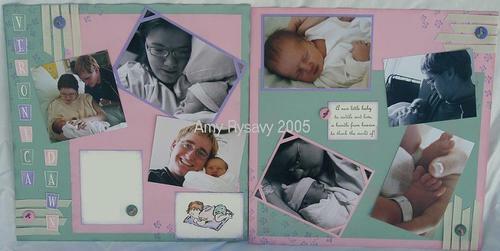 In fact I haven't done *any* scrap booking since Josie was a couple months old. When I scrapbook I don't do many cards - my desk is of a decent size but when I'm doing my 12x12 pages I have NO room for anything else - plus I really do make an awful mess and my "OCD" kicks in and I *can't* work on anything else until it's all cleaned up! I bought 2 clear plastic 12x12 containers at Michael's (for 50% off of course *big grin*) so hopefully that will help me w/ the mess as I can put the page(s) I'm working on in there if I need to do something else. I *will* be posting pics of my pages - including the old ones. I've done about 40 pages so far and it's come a long way since I first started. I'm actually pulling apart some of my older pages *shock* *gasp* and re-doing them. I'll take pics before and after tho. I'm not doing it to ALL my old pages - just the few that really look wrong to me. When I first started SBing layout meant nothing to me - I totally didn't get it. I just slapped on the pics and journaling wherever and didn't give it a second thought. *Some* of the pages still work like that but some really are a mess and need to be put in a proper layout to look how *I* really wanted them to. (I know some ppl think it's a crime to re-do old pages but I *have* to do this - there are a few pages that just bug me and since it's my book I'm gonna make them look right! lol).